On 7 July 2014, I was asked byby HRM Liadan ingen Fheradaig II to make a ‘fancy Viking hood’ for her to wear during her second reign. Due to the Crown and Coronation being held on the same day, there was a tight turn around for the design and creation of the hood. 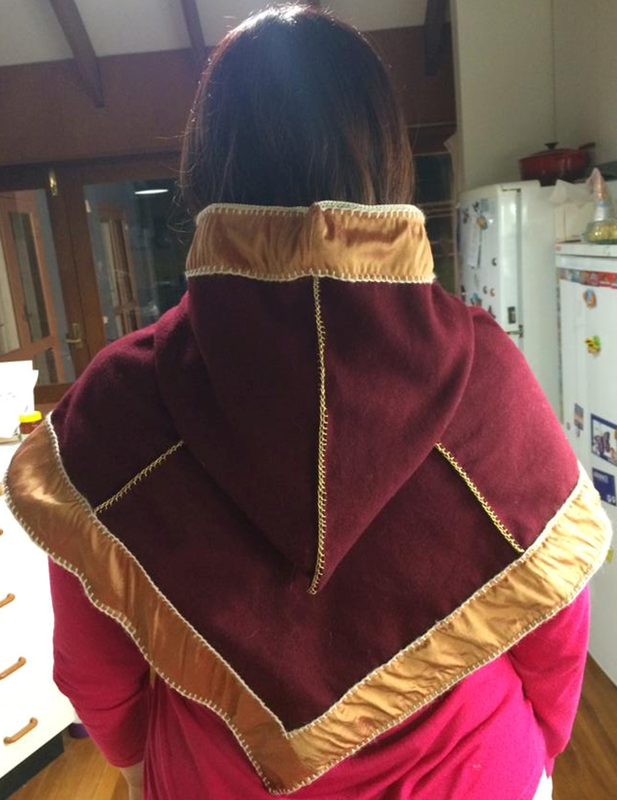 The wool, silk and linen material used in this hood was provided by HRM Liadan. The hood I made is based on the Norwegian Skjoldehamn hood (Figure 1), as described by Løvlid (2009), which is made of three squares of wool – the main square and two gores that are roughly half that dimension. The finished product, finished on 26 July 2014, took me approximately 27 hours to cut out, construct and embroider. This excludes the time taken by Amelot to weave the wire trim around the face of the hood. This is the first time I’ve ever made a hood, a Viking style item, and the first time I’ve used Ösenstich or appliquéd with blanket stitch. Overall, I’m pleased with the result. Embroidery tip: I found it difficult/strenuous to get the threaded needle (with wool or metal thread) through the thick wool fabric. At first, I tried using a rubber band on my fingers to increase the grip on the needle but it wasn’t helping enough. In the end, I discovered that using an awl to prepunch each stitch immediately before making it actually made the embroidery (blanket stitch and osenstich) much quicker and easier to complete without straining.